Detailed:The main bearing and each dial are driven by electromotor of main equipment through reducer, and numbers of rings and rolls which are rolling in the ring channels are driven by dial through plunger. After being crushed by hammer crusher, the big materials become small ones and they are sent to the storage bin by elevator. 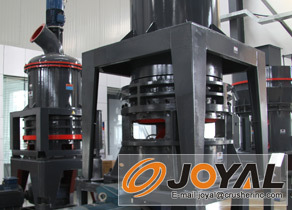 The electromagnetic vibrating feeder sends them to the middle of first dial evenly; the materials will be driven to the edge of dial by centrifugal force, and fall into the ring channels and are pressed, crushed and ground by the grinding rings and rolls. Then the materials fall into the second and third ring and crushed and ground. The high pressure centrifugal blower inhales air from the outside and blow the materials which are ground in the third ring to powder Separator. The rotating turbo in the powder Separator makes the coarse materials return to the mill and reground, while the fineness mixes with the air and be drawn to the cyclone and be discharged from the discharging valve which is in the bottom of it. The air which mixed with very little fineness are purified by impulse dust catcher and discharged by blower and muffler.